It’s easy to get lost on the way to the unMonastery. Wandering down the ancient, winding cobblestoned streets of Matera, Italy, you clamber past houses and empty restaurants carved directly into the mountainside, ending up at the bottom of a valley that overlooks a plunging ravine. At that point the smell of pasta sauce might be the best guide, as it wafts down from the unMonastery’s cavernous kitchen – where, on a given evening you might find a dreadlocked German hacker, an Italian minister of finance, and an American entrepreneur making pasta together by candlelight and chatting about the future of data surveillance. The story of the unMonastery is as winding as the path to get there. It was originally conceived in 2012 by Edgeryders, a group of young people brought together by the Council of Europe to write a report on “youth in times of crisis.” In other words, to help the EU’s governing bodies work with a generation who, because of drastic social change and economic downturn, have been more likely to spend ten years accruing debt in college or joining a tech start-up than taking over the family business. In 2013 unMonastery found an ideal testing ground in Matera, Italy. Besides Petra in Jordan, Matera is the oldest continually inhabited settlement in the world – prehistoric humans first settled there around the end of the last Ice Age – and it has a long history of monasteries and utopian communities. In 1993 its ancient valleys of cave dwellings, or sassi, were declared a UNESCO heritage site. These days the city of 60,000 inhabitants, relatively isolated in the heel of Italy’s boot, struggles with the same issues as many other cities of its size across southern Europe: economic depression, lack of public services, and the brain drain of young people to larger urban centers. In short, Matera epitomises the exact kind of challenges that Egeryders was created to address. At the start of the 2010s the Matera-Basilicata regional government decided to bid for European Capital of Culture in 2019 – think of the model that has emerged of trying to reinvigorate cities like Sharjah, Marrakesh, and Liverpool with biennials and triennials of contemporary art – and allocated a total of 30 million euros to sponging up cultural initiatives leading up to the bid. The municipality offered Edgeryders a disused former seminary to turn into the unMonastery for four months at the start of 2014, along with 35,000 euros for travel and living expenses. After an open call receiving around 50 applications, 14 unMonks were selected to move in, each with a proposal to improve local life with projects like urban farming and teaching coding to kids. Matera is built on top of itself: the architecture of the two valleys comprising its old city is a complex layering of dug-out caves and jutting stone structures, the roof of each house supporting the street of the layer above. The former seminary that housed the unMonastery is likewise stacked in two levels, and its interior spaces are a mix of carved and constructed – sloping, rocky ceilings intersect with starkly whitewashed walls. Upon moving in, the unMonks renovated the long-uninhabited rooms, which became co-working spaces jumbled with cords, meeting rooms and communal sleeping areas. Life/work divide: successfully dismantled. So what happened when this online community became a commune? 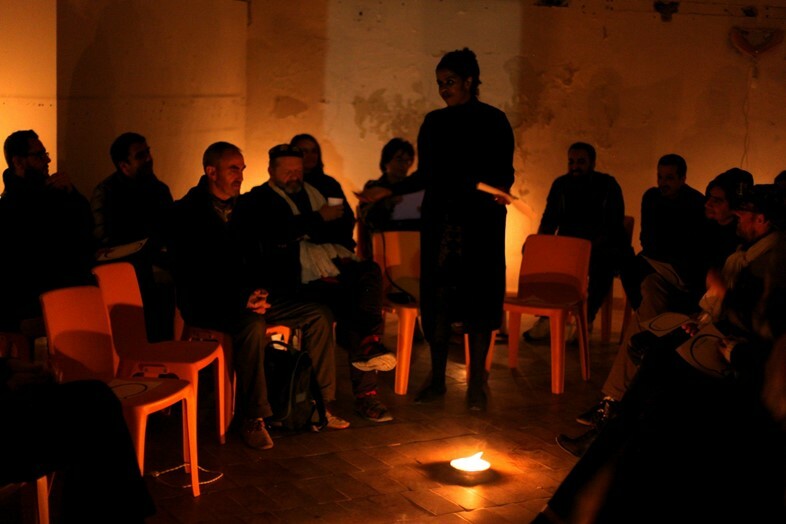 It wasn’t until this October, when Edgeryders hosted its fourth “Living on the Edge” conference (LOTE4) in Matera, that there was a moment for the Edgeryders and others to regroup and assess. 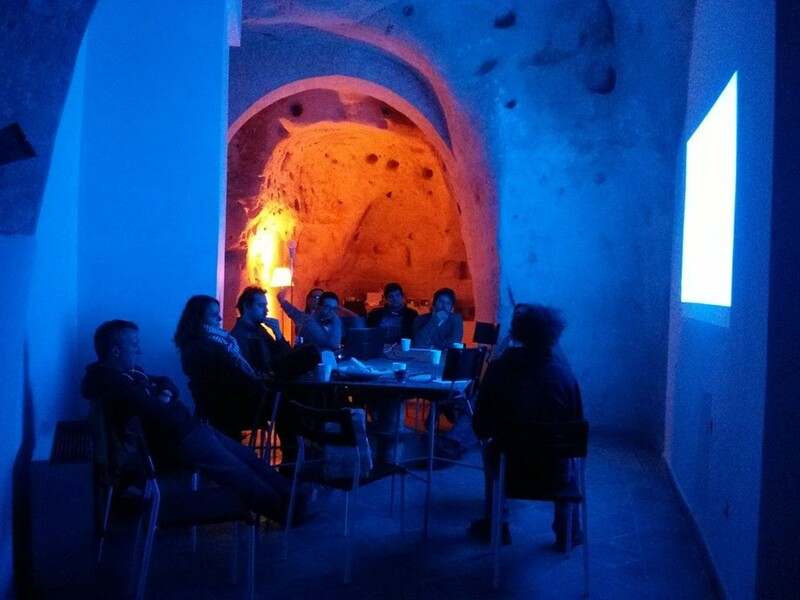 Around 70 people showed up in Matera for the four-day conference, including most of the unMonks, many seasoned Edgeryders, some invited experts, and several curious newcomers who might have stumbled across the project on Twitter. And the timing was perfect: Matera had just emerged victorious and won the bid for Capital of Culture 2019. The theme of LOTE4 was “The Stewardship,” or the communal management of resources when government structures break down. That is, how do we keep the toilets flushing and the wi-fi working when public infrastructures (inevitably) fail? Session topics ranged from the practical (“How tourism can help rural areas”) to the abstract (“Learning to learn about futures thinking”) to the WTF (“Pirate utopias, psychotopology of everyday life, and ratholes in the babylon of information”). By the end of the weekend it had become an inside joke that no one could decide exactly what stewardship meant anymore. Rarely are so many ideas for changing the world floating around in one room, much less in a single remodeled cave. One central idea that continually arose was the elimination of unnecessary waste inherent to the post-Fordist economy. Presented solutions included TrashOut, an app that allows users to document and geotag illegal trash sites, and Open Droplet, a water usage sensor that uses acoustics to provide realtime feedback on water consumption. The conversation may have veered towards “there’s an app for that” utopianism at times, but it wasn’t all DIY and anarchy. That mix of off-the-grid perspectives with those of policy makers and entrepreneurs made for an unusual dynamic, and highlighted the fact that most of us rely on the systems we criticize. In one session about the so-called sharing economy, Robin Chase, the founder and CEO of ZipCar, said she felt “like the most conservative person in the room” for defending start-ups like AirBnb. Hadn’t anyone there paid for their trips to Italy by renting out their spare room on the website? Heads nodded uncertainly around the room. Therein lies the central paradox of Edgeryders and of the unMonastery: the desire to have one’s radical cake and eat it too. Many expressed an uneasy ambivalence about the fact that the “anarchic” or “punk” program remains tied to governmental structures for support. As unMonk Ben Vickers puts it, that’s precisely the goal: “It’s been about seeking an understanding of how a network can interact with power.” And given today’s rampant inequality and increasing centralization of resources, finding strategies for collaboration with industry and government without being subsumed by profit-making models is indeed an urgent (and brave) task. But throughout LOTE4, it became clear that the flipside of that challenge is equally necessary to its success: how a network can interact with those not in power. Most of the unMonks arrived not knowing how to say more than ciao in Italian. The projects they came up with to help the city were invented in advance, from an outsider’s perspective, and it was a tall order for them to get a grip on things during only four months living there. Take one project that was prototyped called unTransit, a public transport app for checking bus schedules in Matera. Those sorts of apps might be successful in cities like London – but during one session at LOTE4, a local resident said he thinks Matera just needs a better transport system, not an app. He also asked why people should need smartphones to access the bus schedule, especially given the city’s aging population. Apparently some locals might have preferred that more of that million euro culture budget went directly into improving the city’s existing public services. The motto adorning the Edgeryders’ fleece jumpers is: “Networks don’t have borders.” That might be the hope – but it’s not yet the reality. Linguistic, cultural and physical borders remain, and ignoring them can be misinterpreted as insensitivity rather than optimism. That’s one of many lessons that two unMonks, Katalin Hausel and Bembo Davies, are writing about in their follow-up book called The Book of Greater and Lesser Omissions. The goal is for future aspiring unMonks to learn from the first unMonastery in Matera, improving and expanding on the 1.0 version. One amazing thing about digital networks is that they are able to react in real-time to change, absorbing new ideas and morphing, amoeba-like, to become stronger. To borrow the title from a session on the first day of LOTE4: “Follow-up is everything.” The conversations taking place on the Edgeryders website right now are moving forward with renewed energy, and an overall sense of optimism for the long term pervades. Benedictine monks have been learning how to calibrate their societal dependency with autonomy since the sixth century – it might take a while, but in that sense there couldn’t be a better model to draw from.